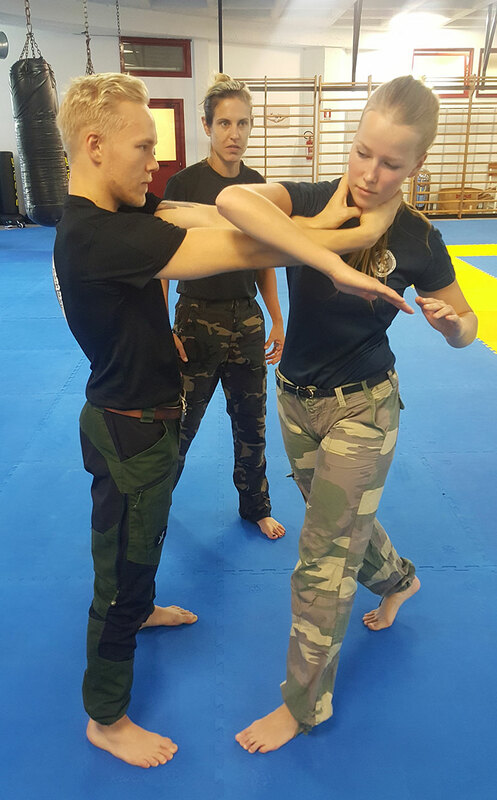 Self-defense classes: Another Martial happy meal? 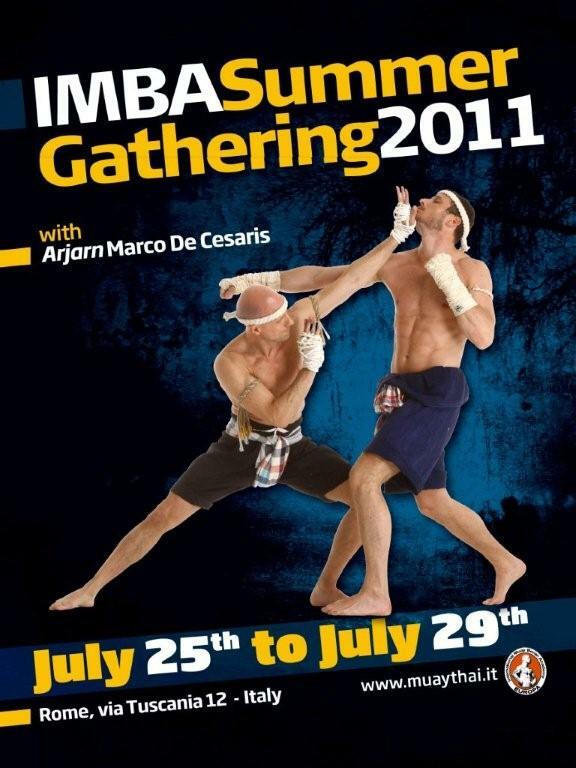 IMBA World Day: what does it mean? 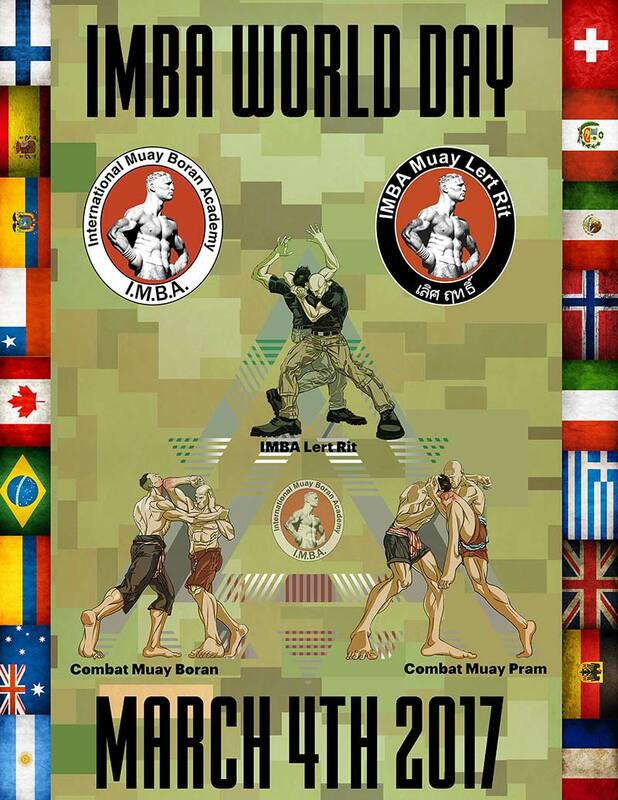 4 March 2017, third edition of IMBA World Day! 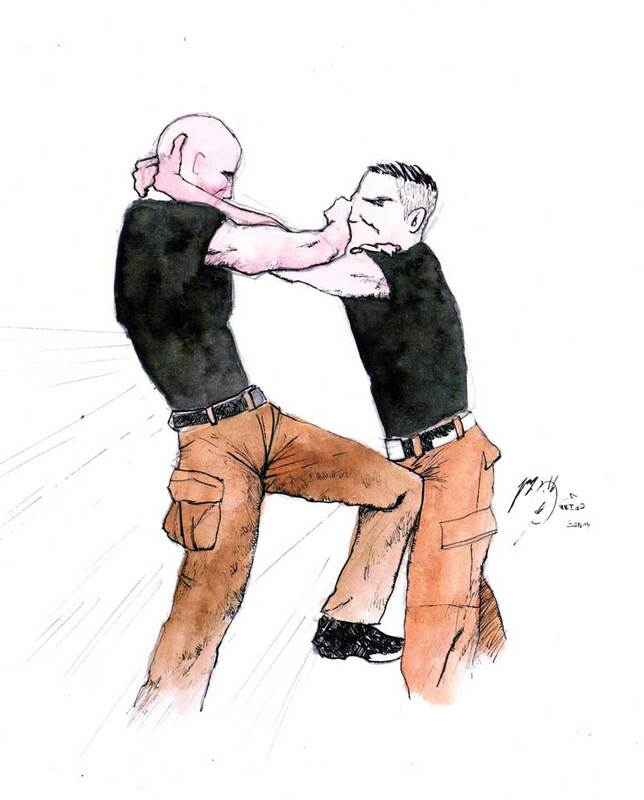 You want to learn self-defense? 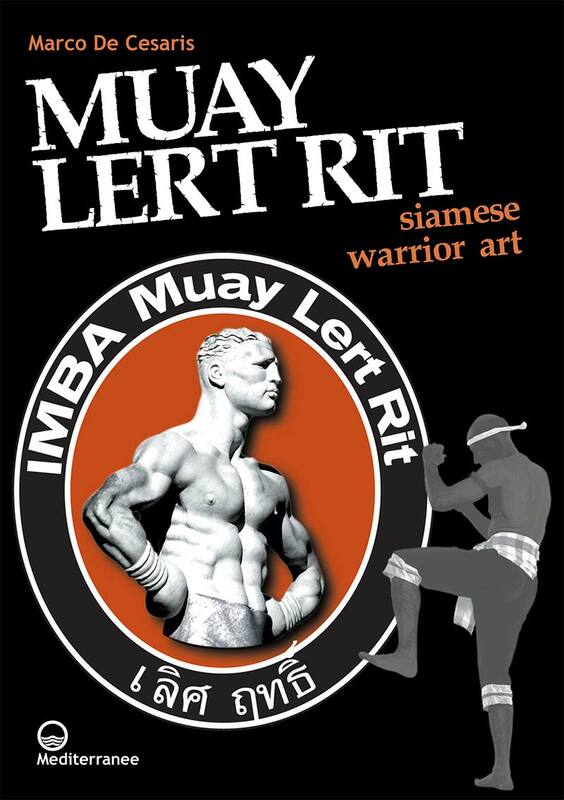 Muay Lert Rit may not be the right martial art for you. 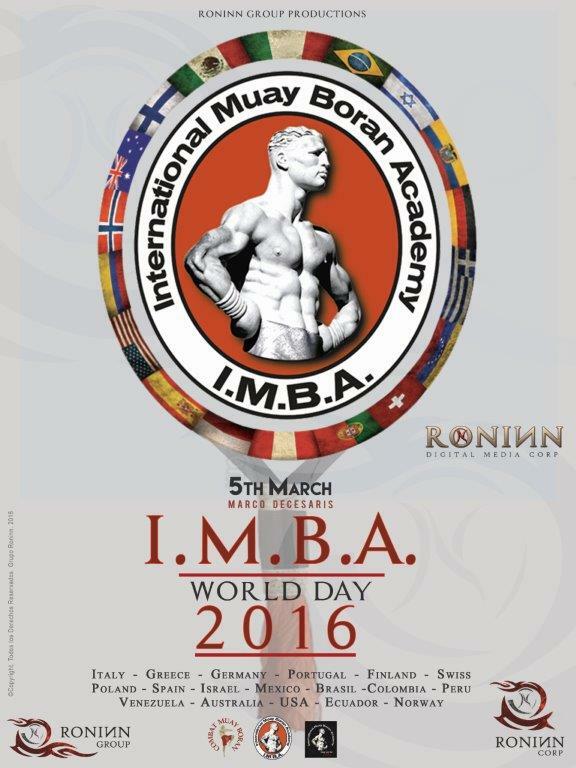 5 March 2016, second edition of IMBA World Day! 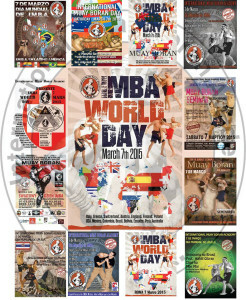 March 2015, first edition of IMBA World Day! 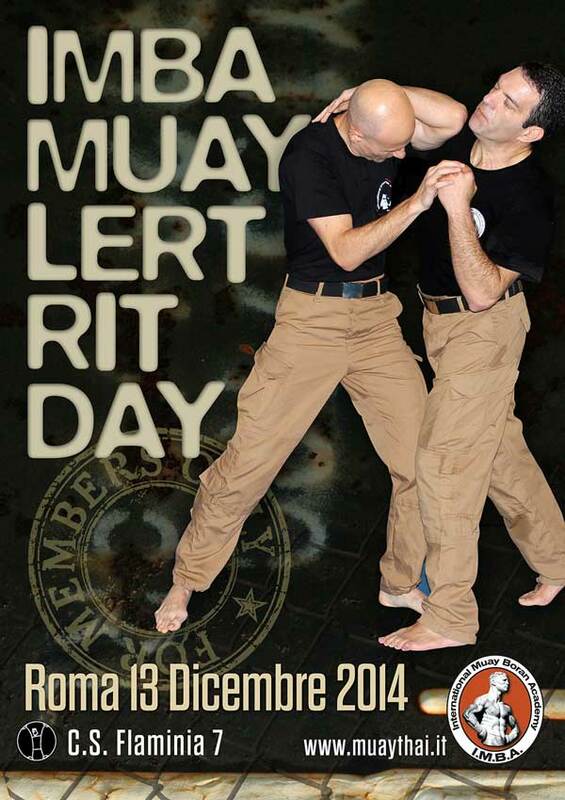 Italian IMBA Muay Lert Rit’s enthusiasts will gather in Rome on December 13th 2014 for a great national reunion! Thai style close range fighting at its best! Italian students and instructors gathered in Rome to be tested by Grand Master Marco De Cesaris. 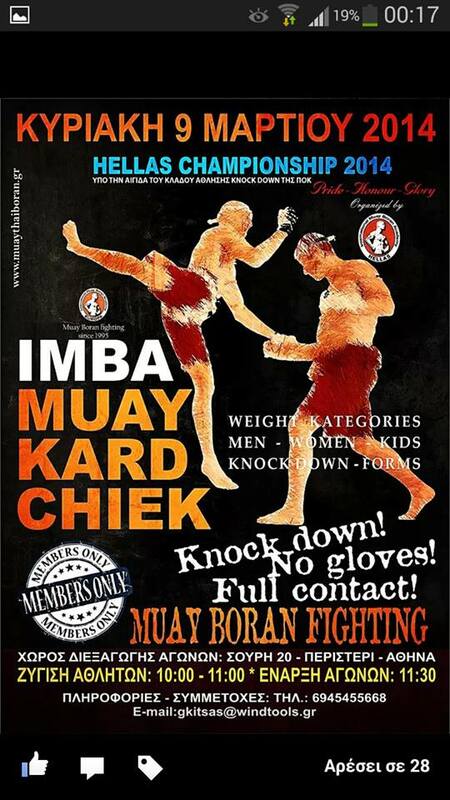 All IMBA members are periodically tested to upgrade their Khan level. 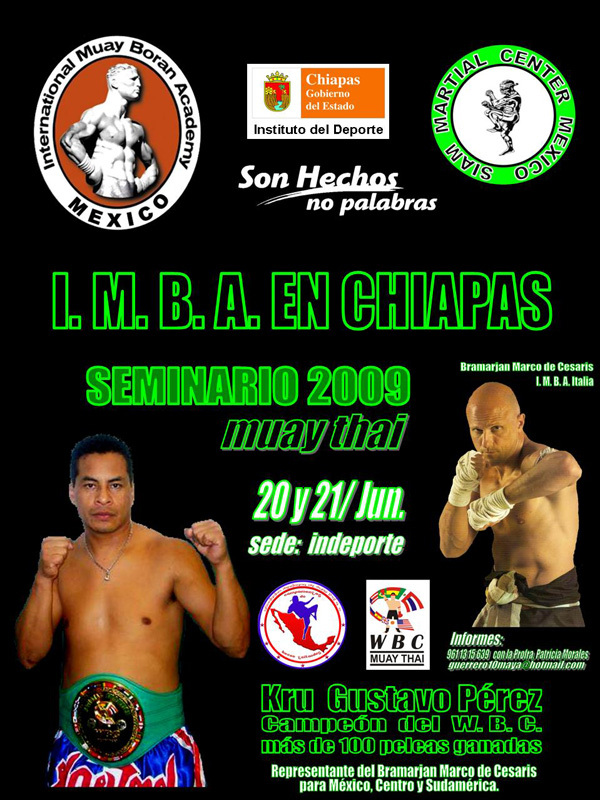 All examinations, both for students and instructors, are organised according to the Official IMBA Curriculum that is used in all IMBA academies worldwide. 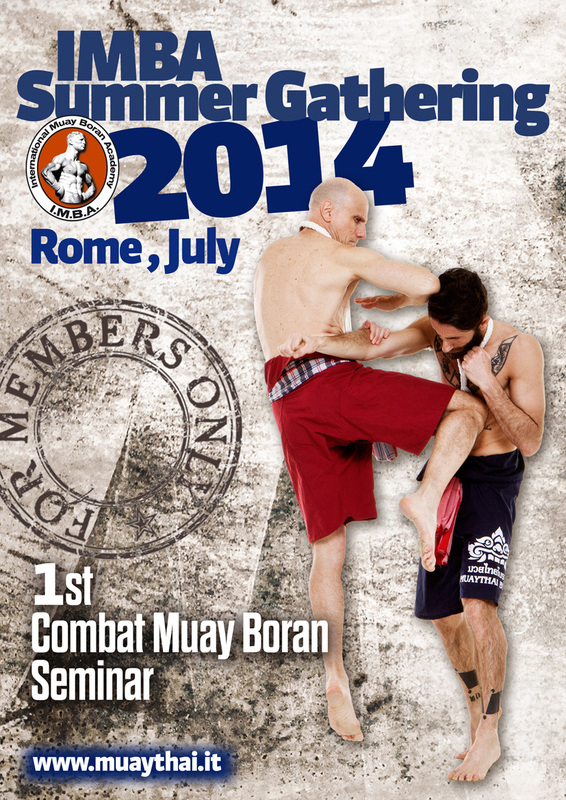 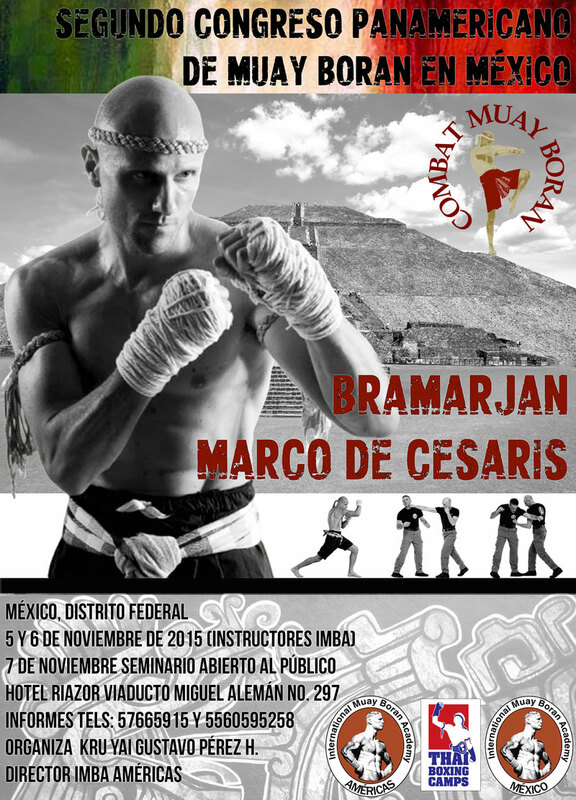 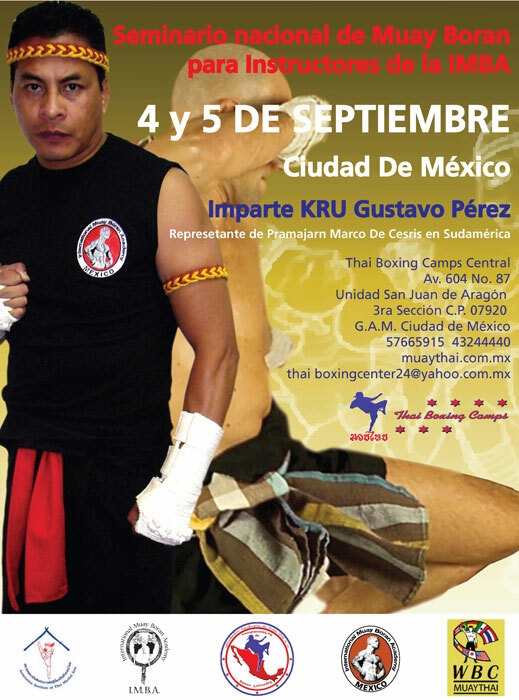 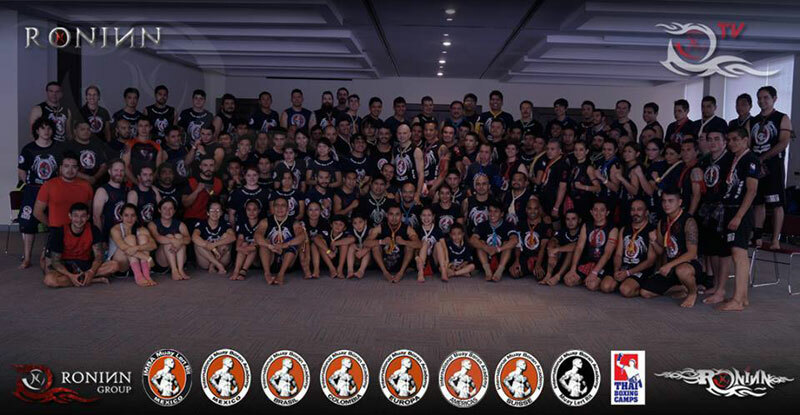 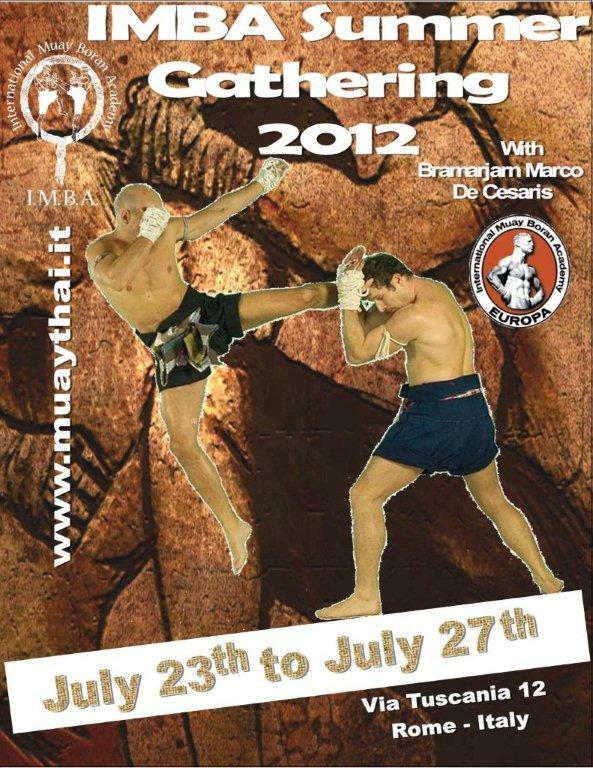 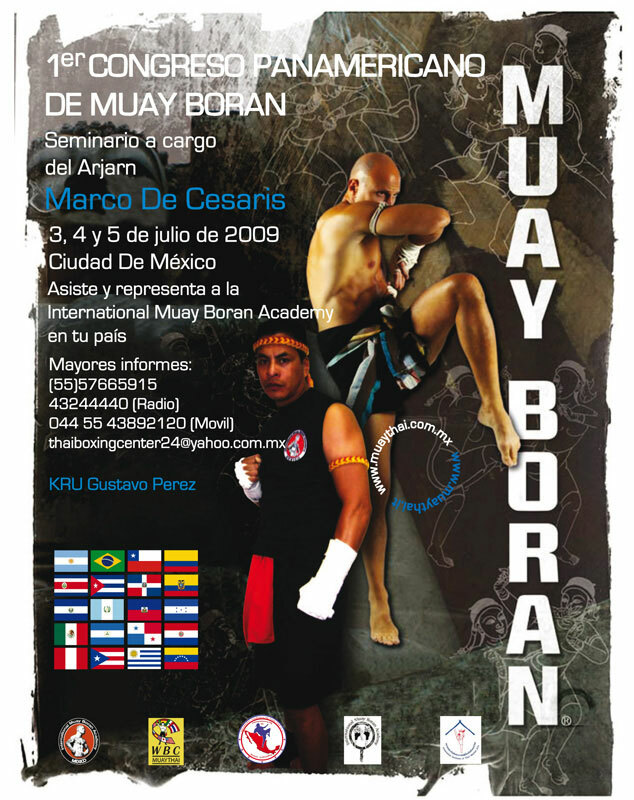 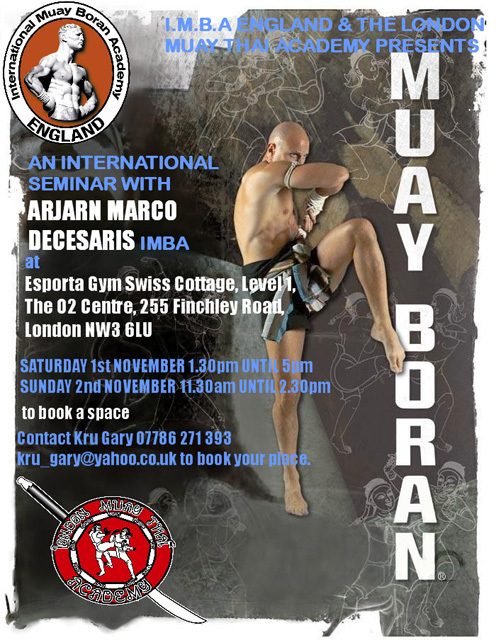 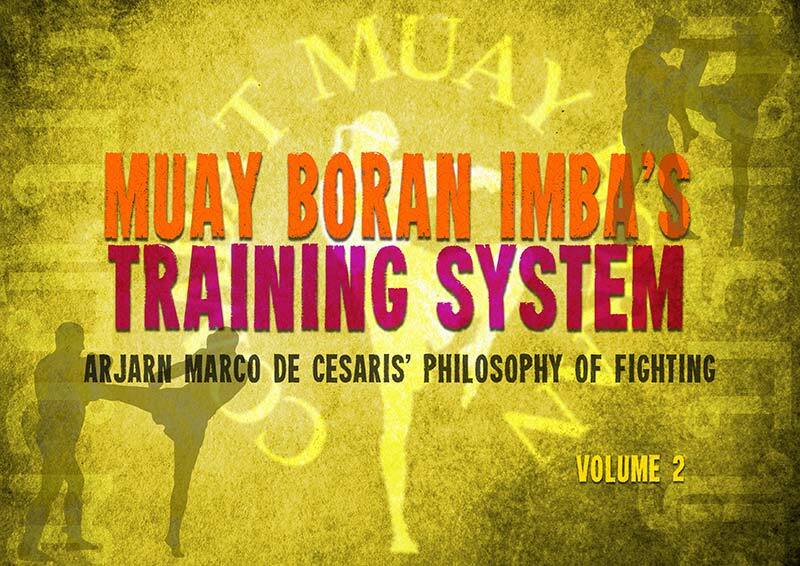 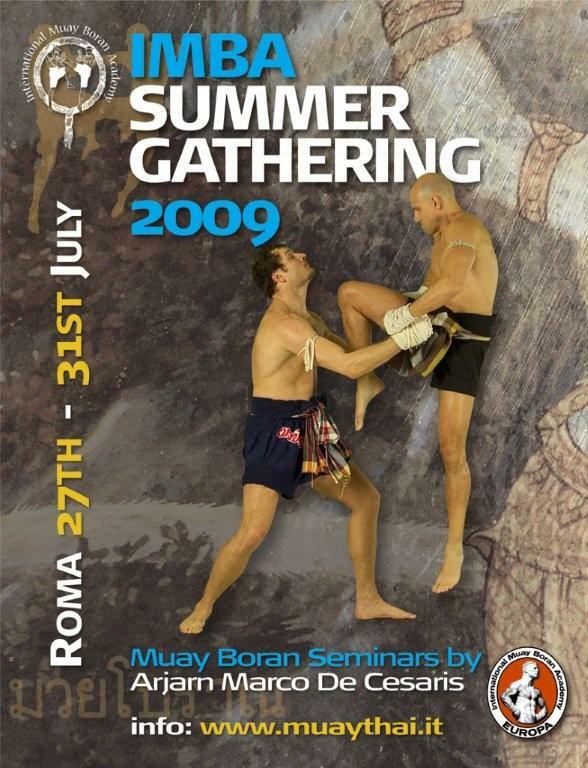 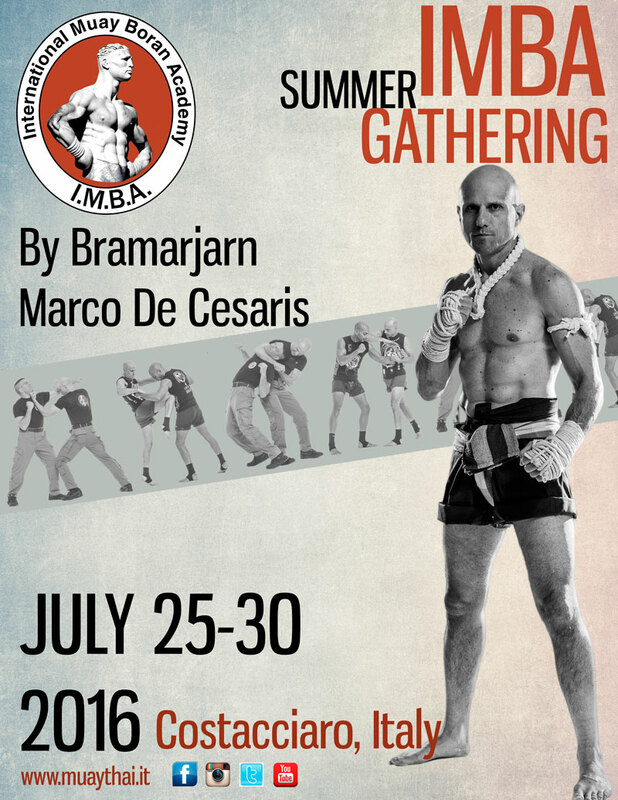 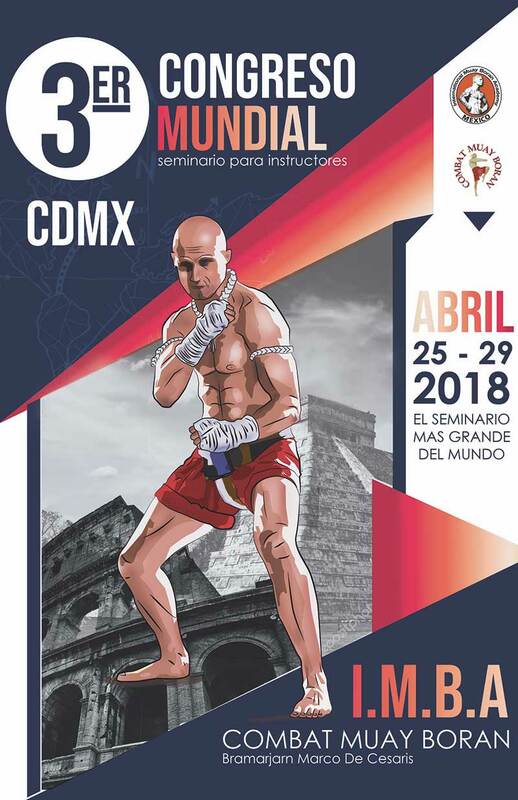 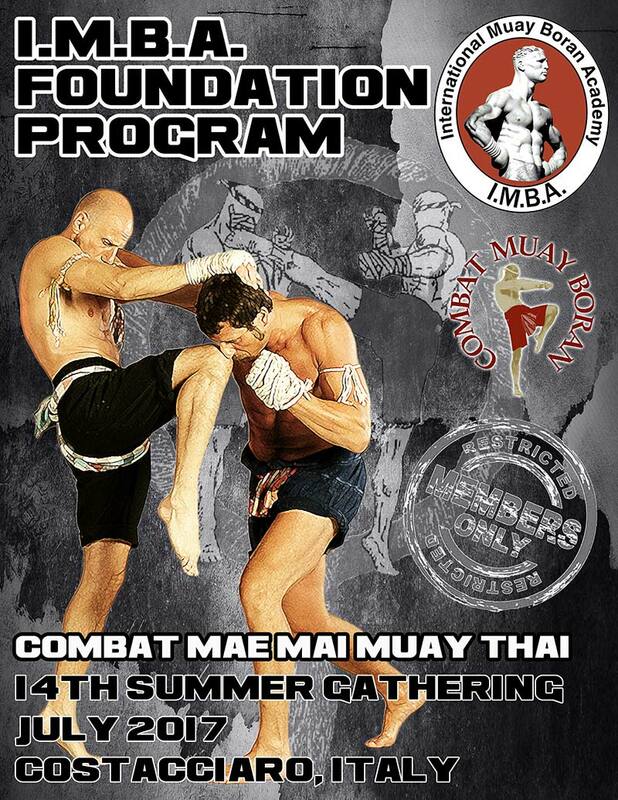 For the first time an innovative Muay Boran teaching format will be presented during the next IMBA Summer Gathering scheduled for July 2014. 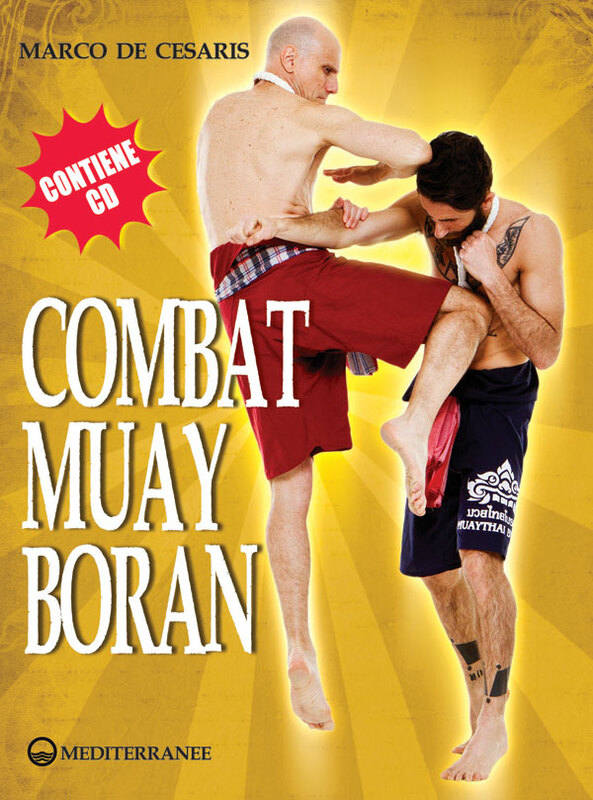 Combat Muay Boran may represent the ultimate blend between thai traditional approach to fighting and western scientific combat methodology. 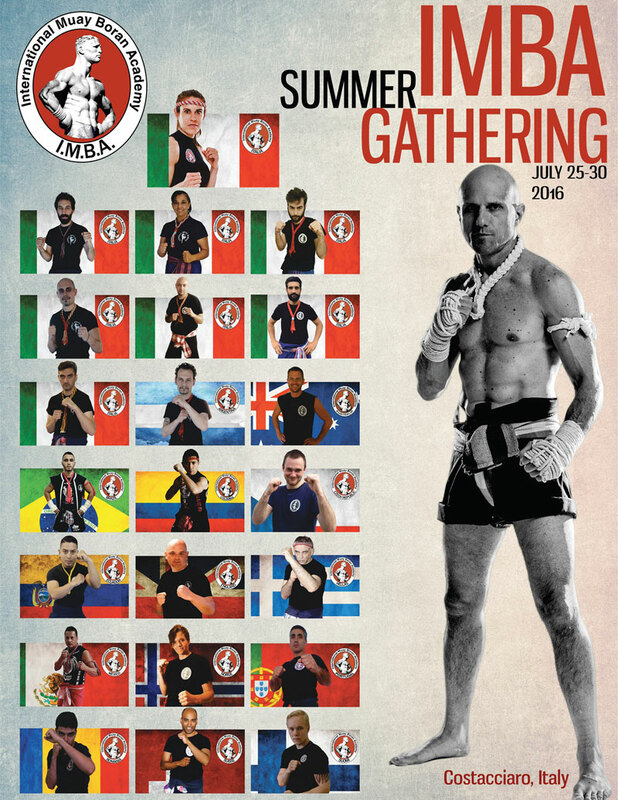 July 2014: IMBA annual summer gathering in Rome! 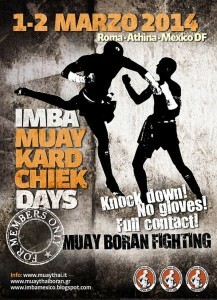 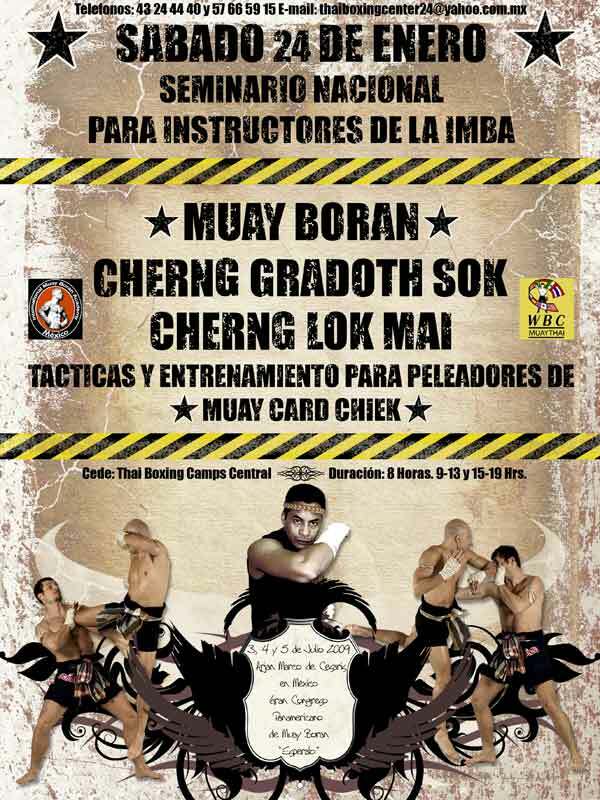 Imba muay lert rit day open for all Members! 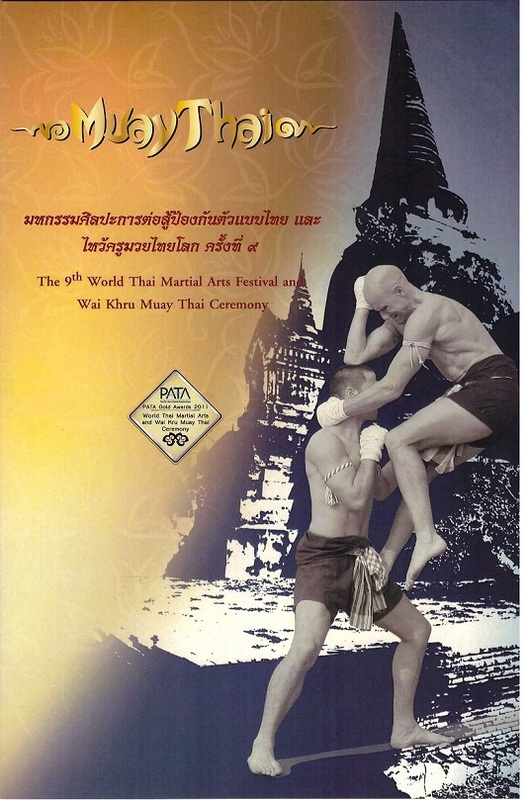 A glimpse of Ayutthaya Thai Martial Arts Festival 2014! 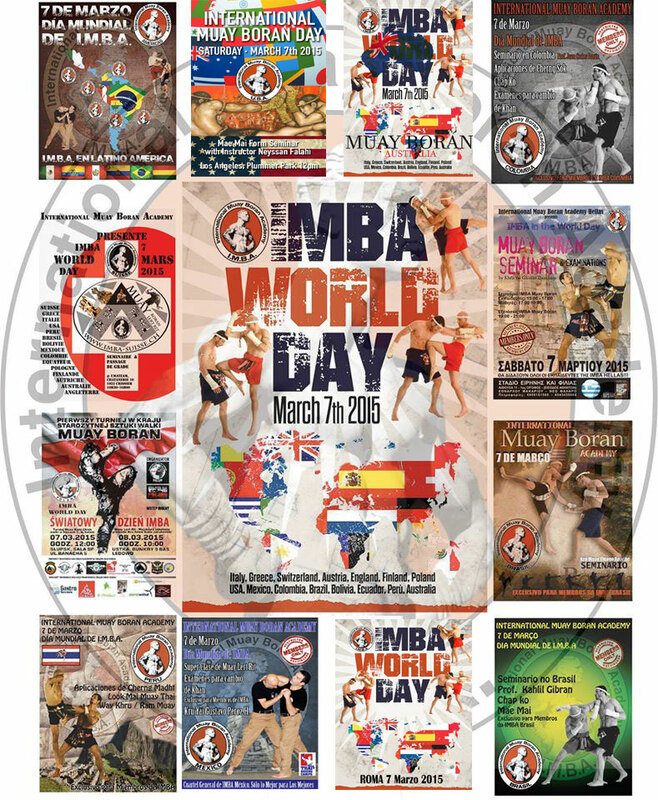 Grand MasterMarco’s Poster by Amazing Thailand (Ministry of Tourism of Thailand) Buakaw, Muay Thai’s most renkowed champion of today. 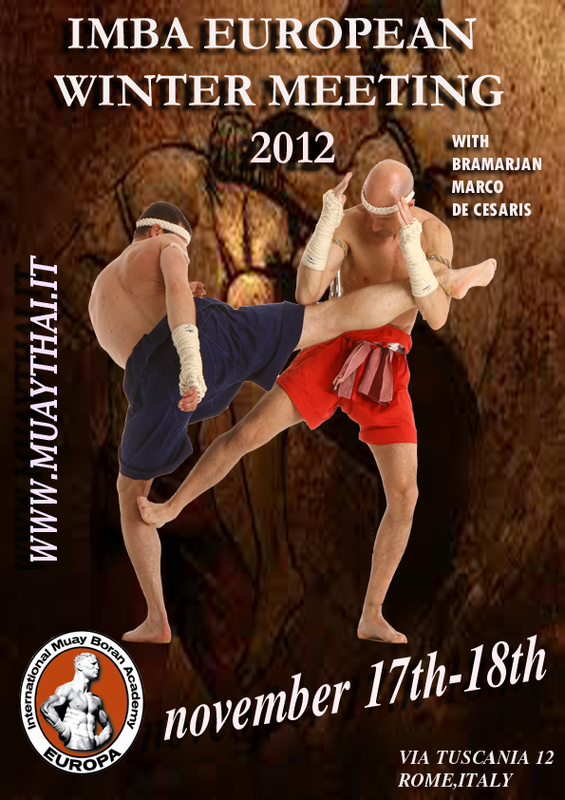 (poster by Amazing Thailand) Students, Masters and Grand Masters all gathered in Ayutthaya to celebrate Nai Khanom Thom and the day of Muay Thai, 17th March. 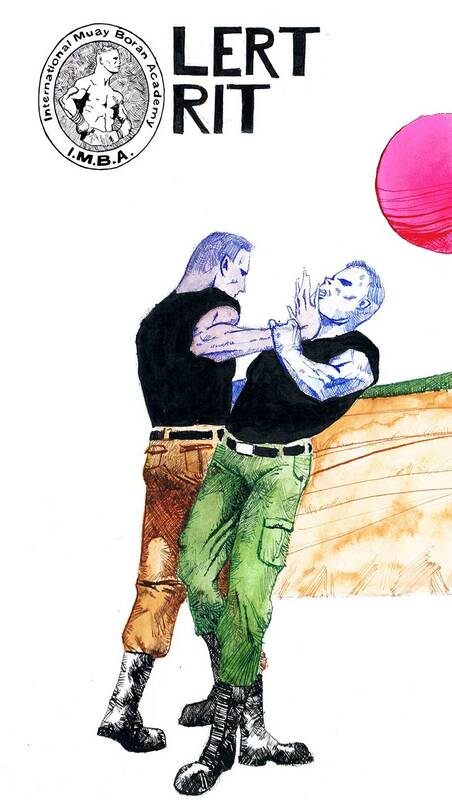 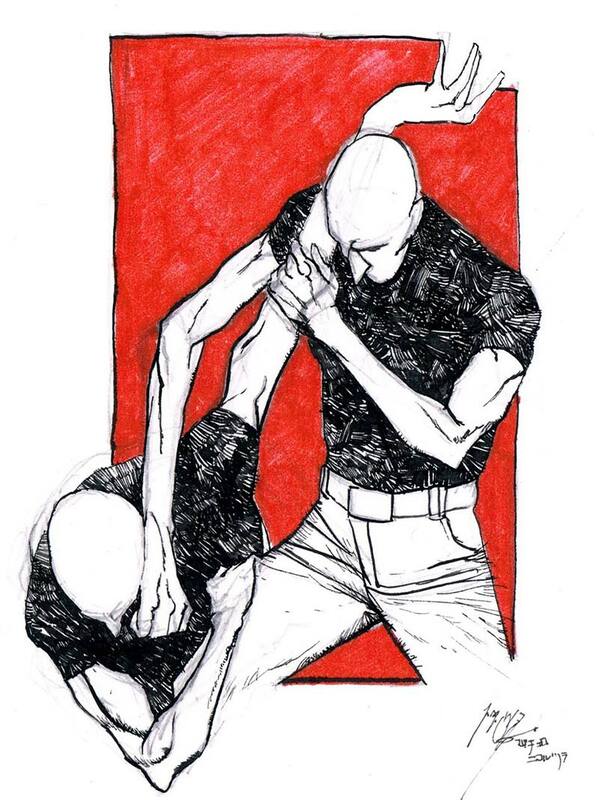 The Art of siamese Grappling: the ideal combination of holds, strikes, locks and throws for realistic close range fighting. 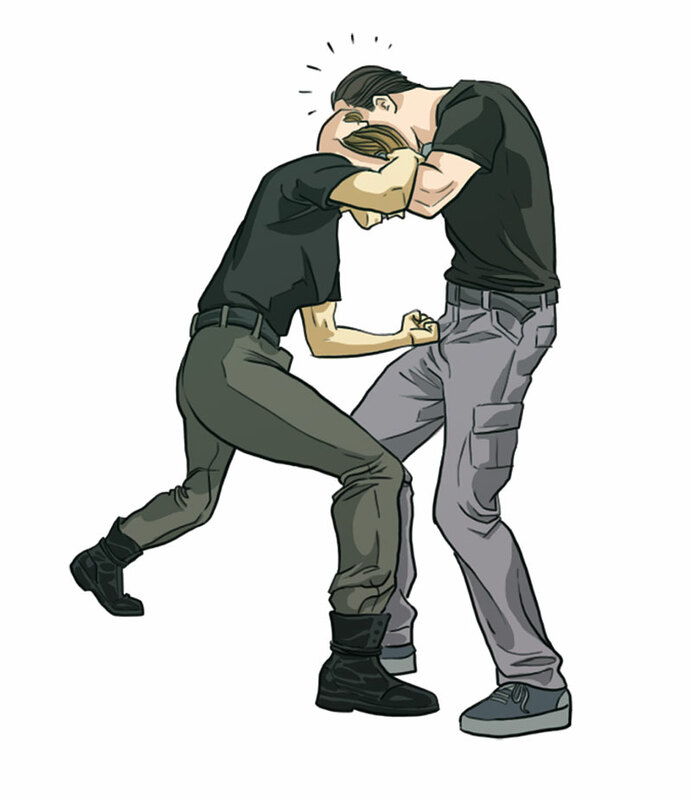 The reality of no holds barred fighting, according to Thailand’s military corps’ traditions updated and formatted for a modern, down-to-earth application. 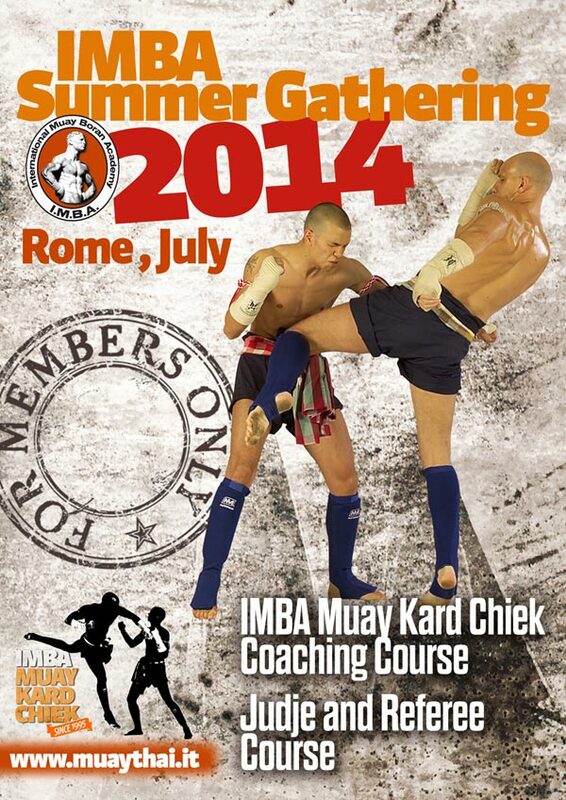 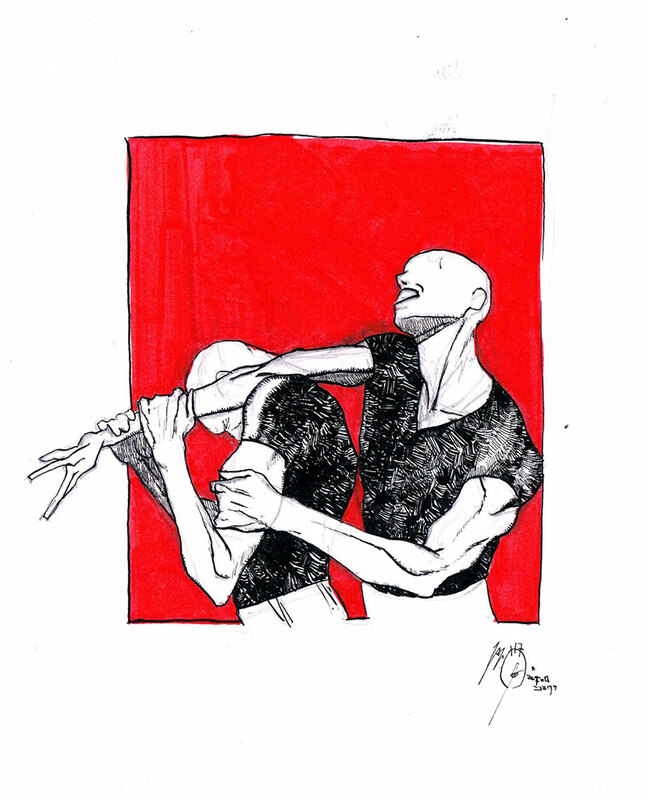 Spirit, Science and Art of siamese traditional barehanded fighting discipline. 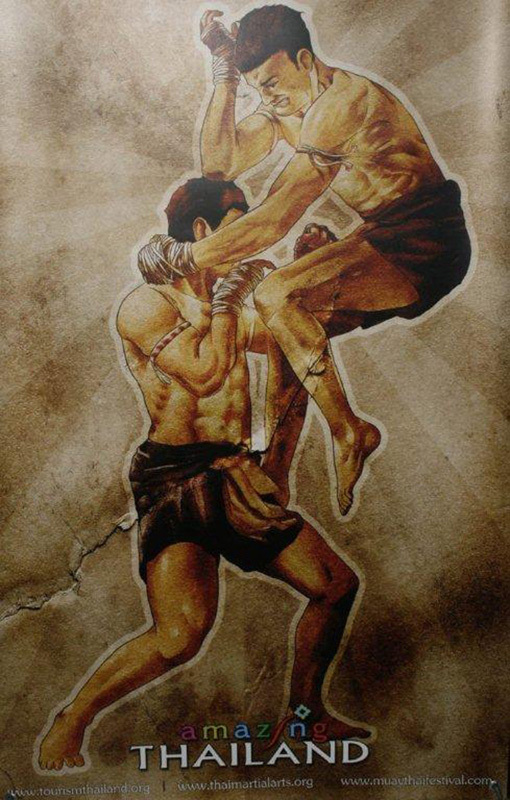 Vintage: denoting something from the past of high quality, especially something representing the best of its kind. 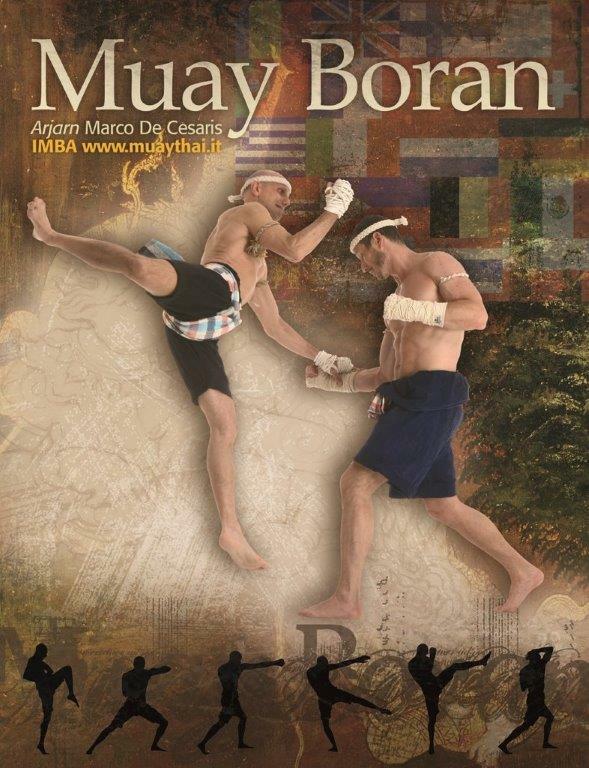 Muay Thai Boran (traditional Thai fighting) is the mother Martial Art that has recently developed, from 1932, into a combat sport known as Thai Boxing or Muay Thai which is nowadays appreciated worldwide. 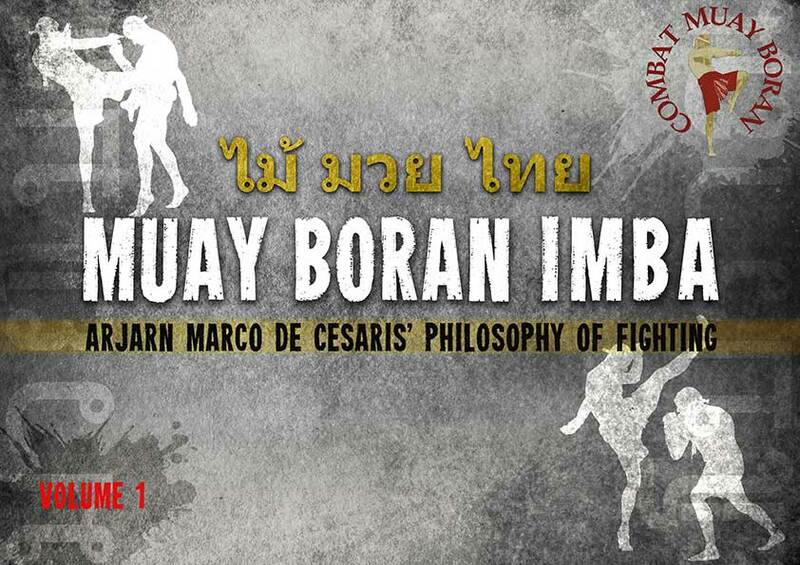 Originally Muay, มวย was the art and science of fighting the fight, as visualized and developed by the ancient Siamese Masters. 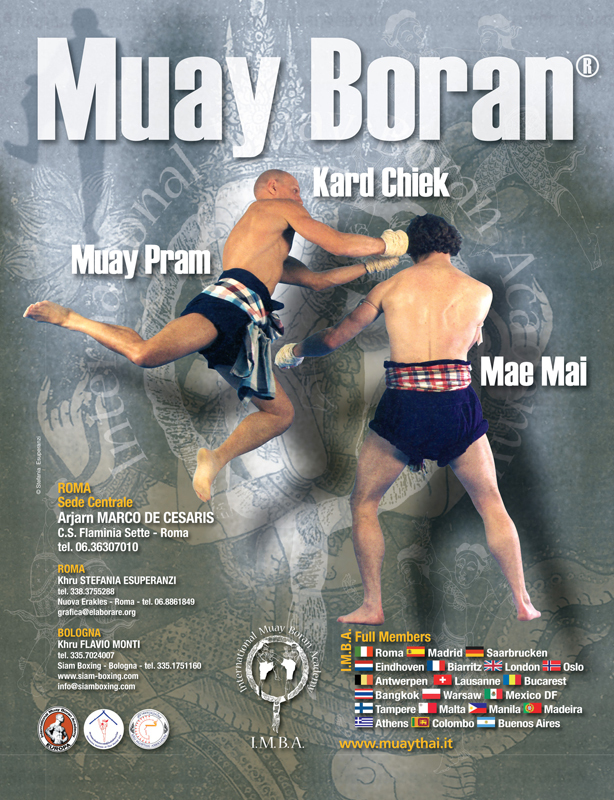 Traditional Muay owes its origins to ancestral fighting methods of the people of Siam, elaborated and refined thanks to a continuous process of trial and correction. 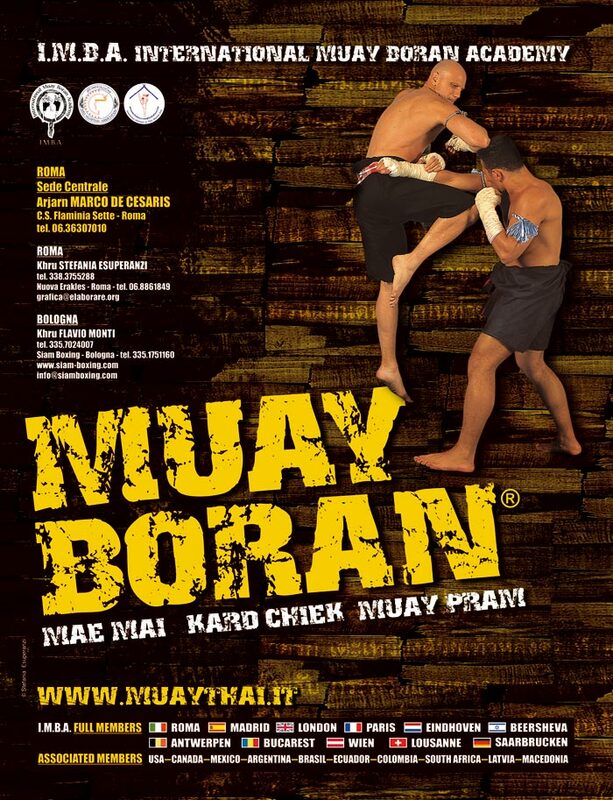 Pichaiyuth, Dti Muay, Pahuyuth, Sillapha Muay, Mai Muay Thai and Muay Kard Chiek: under these and other labels the gruelling Siamese bare handed techniques of hand to hand combat have been practised for centuries, unified today under the umbrella name of Muay Boran. 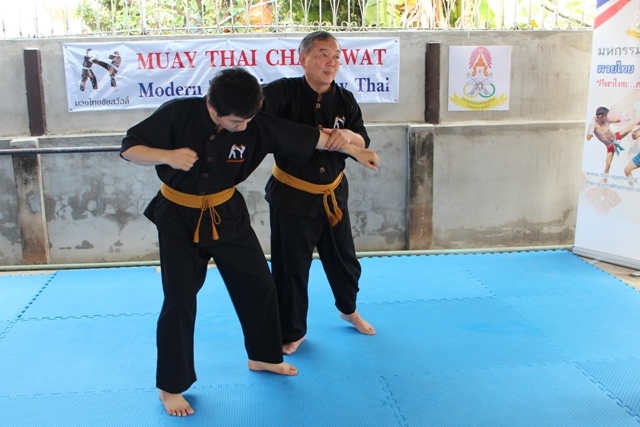 Muay is a Siamese martial art that developed during more than 1000 years, going through different “eras” (Pre-historic, Sukhothai, Ayutthaya, Thonburi, Rattanakosin). 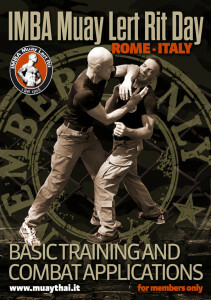 Along the years it has been practised as a hand to hand combat system, a popular past time and a professional sport. 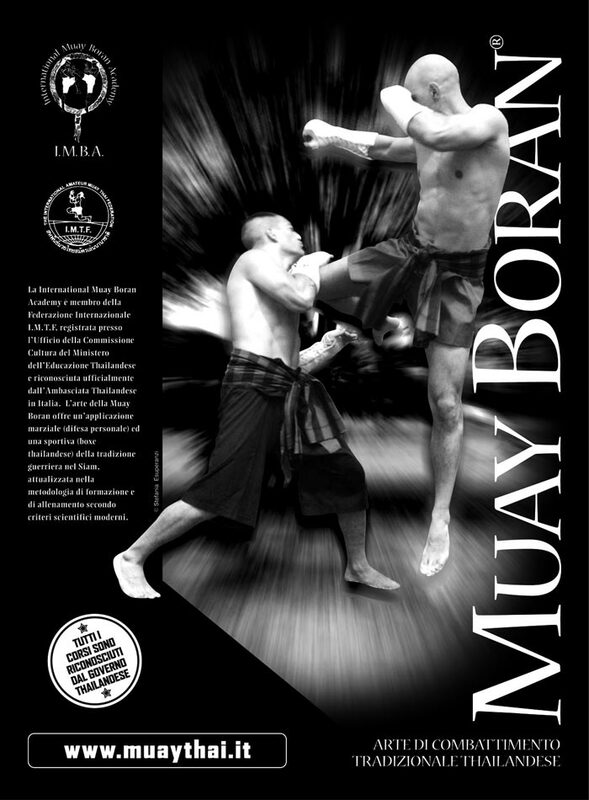 That is to say what is generally labelled as Muay Boran is actually a masterly mix of elements characteristic of different technical settings defined by scholars as Regional Styles (i.e., Muay Chaiya, Muay Korat, Muay Lopburi, Muay Luang, Muay Uttaraditt or Muay Ta Sao) and fighting principles that follow a common logic (like the deceptive techniques of the Monkey Style or Muay Wanorn) made actual and usable by a modern western student thanks to a well-structured system of teaching. 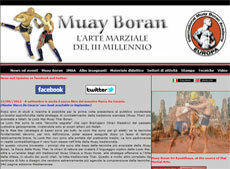 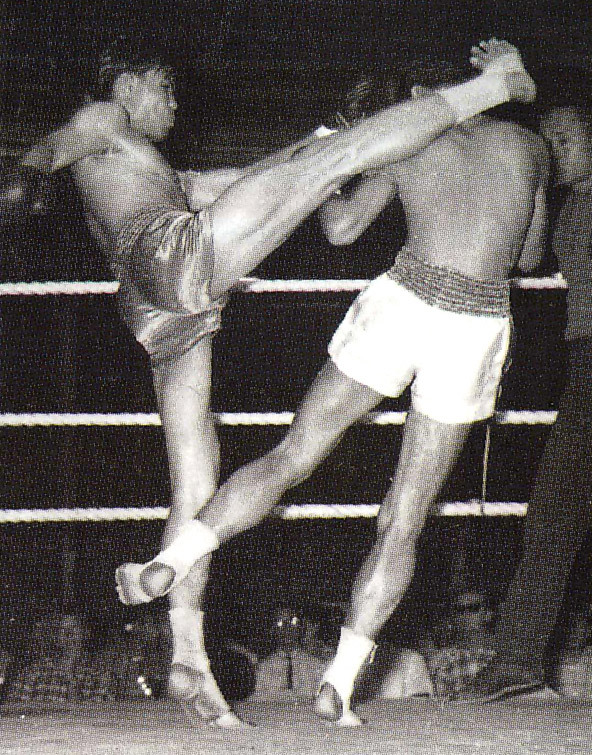 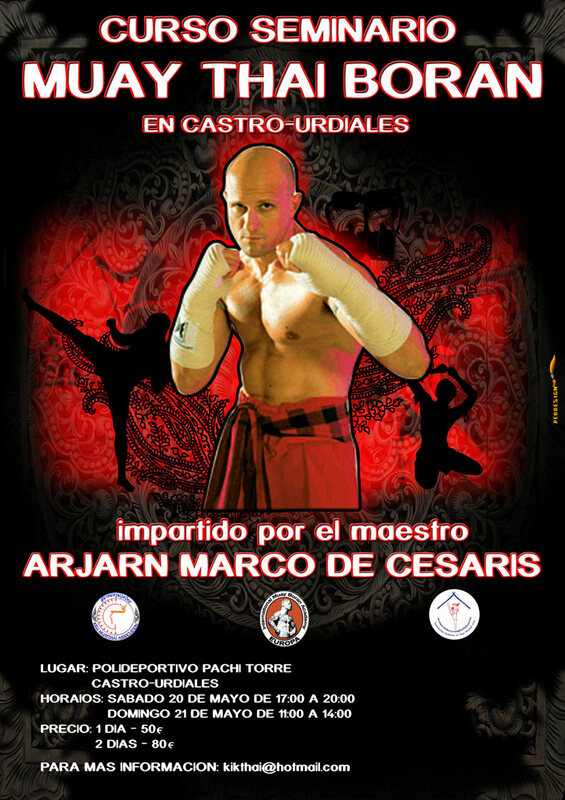 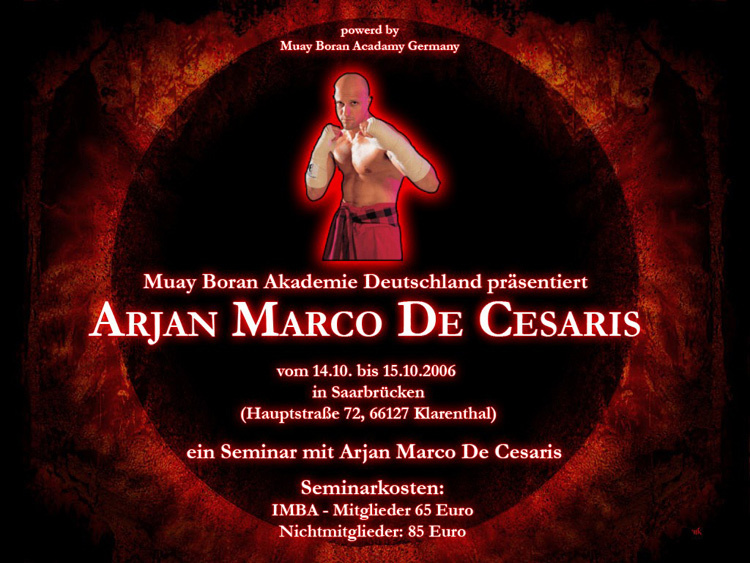 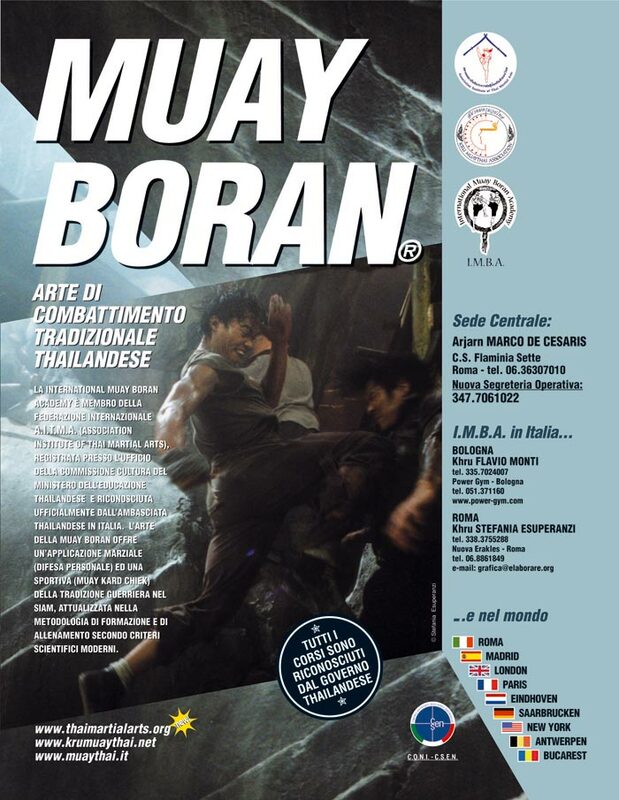 In this sense it is correct to say that present-day Muay Boran is at the same time both an ancient and modern discipline: ancient because of its combat strategies and traditional techniques which date back to ancient times and modern due to the codification of a varied and structured technical background created in modern times by experts and scholars of Siamese martial traditions, totally immersed in the reality of today and directed towards future developments. 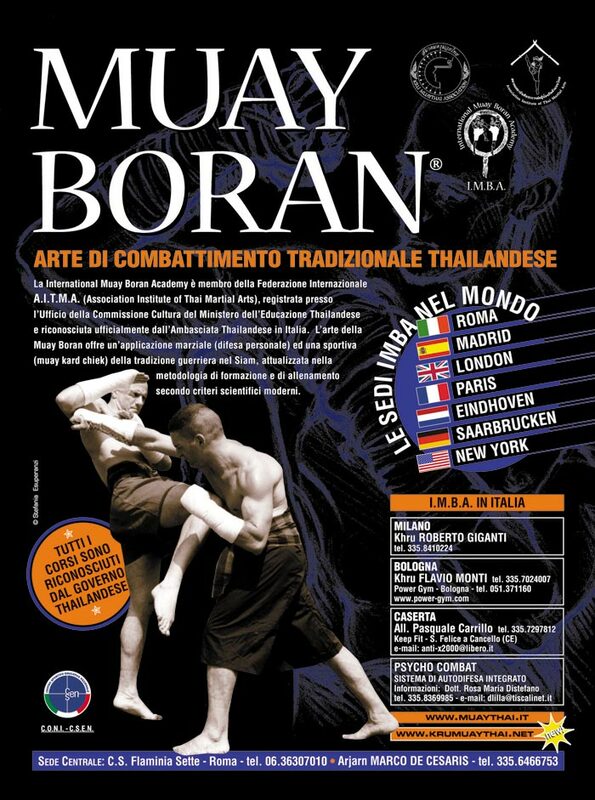 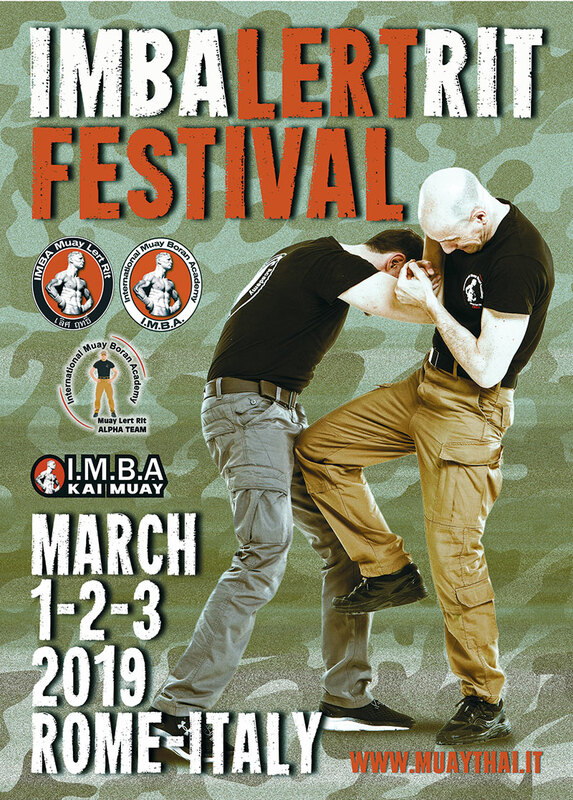 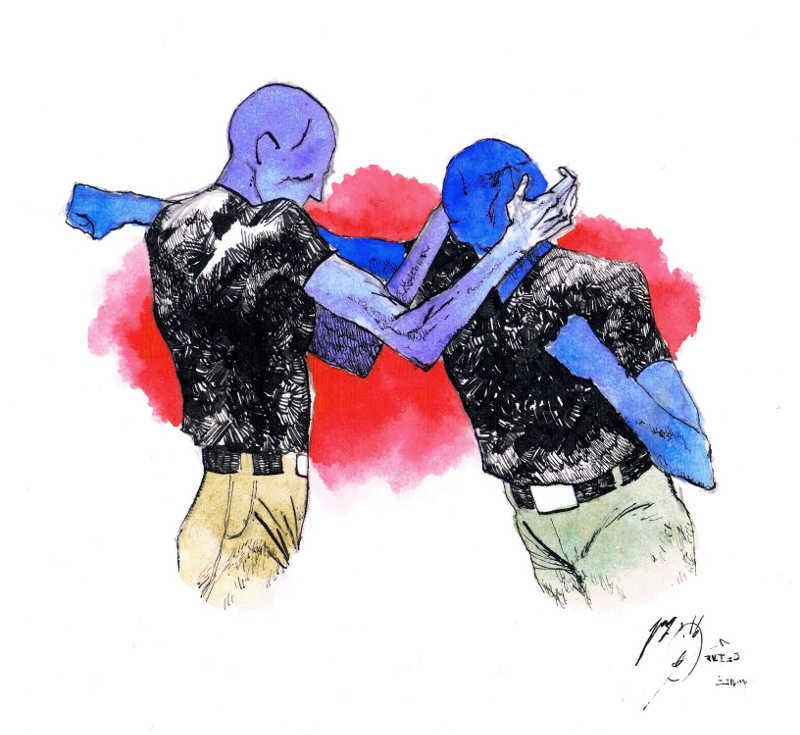 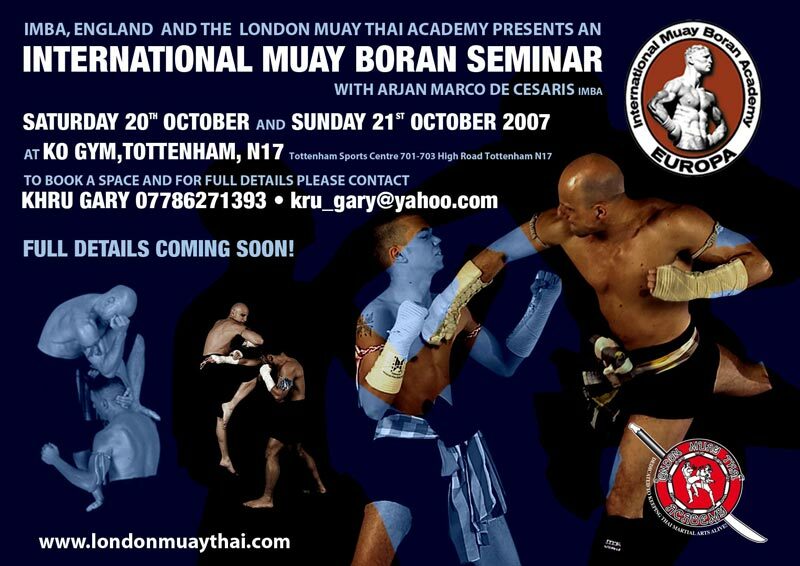 Contemporary Muay Boran adapts traditional Siamese Martial Arts to the realistic requirements of western practitioners: self-defence, fitness, self-confidence building, Thai culture learning. 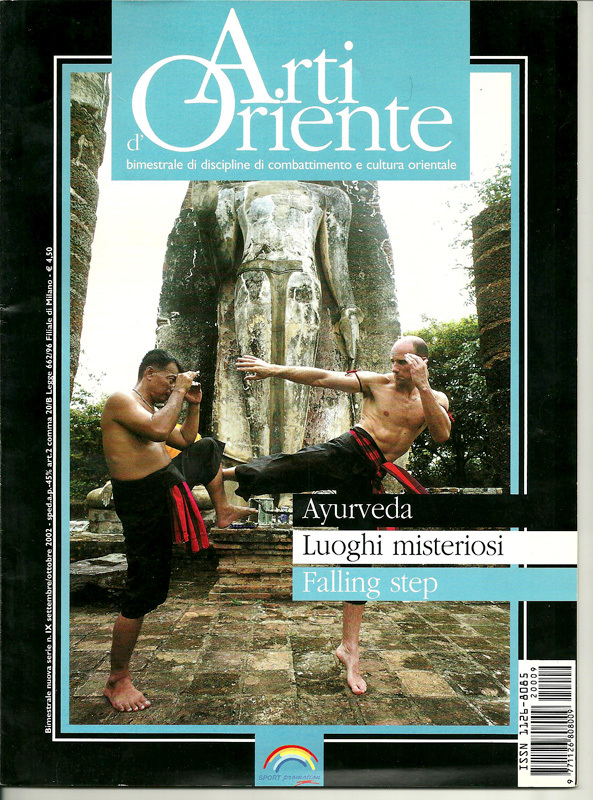 When East and West meet, with mutual respect, the best of both worlds emerges. 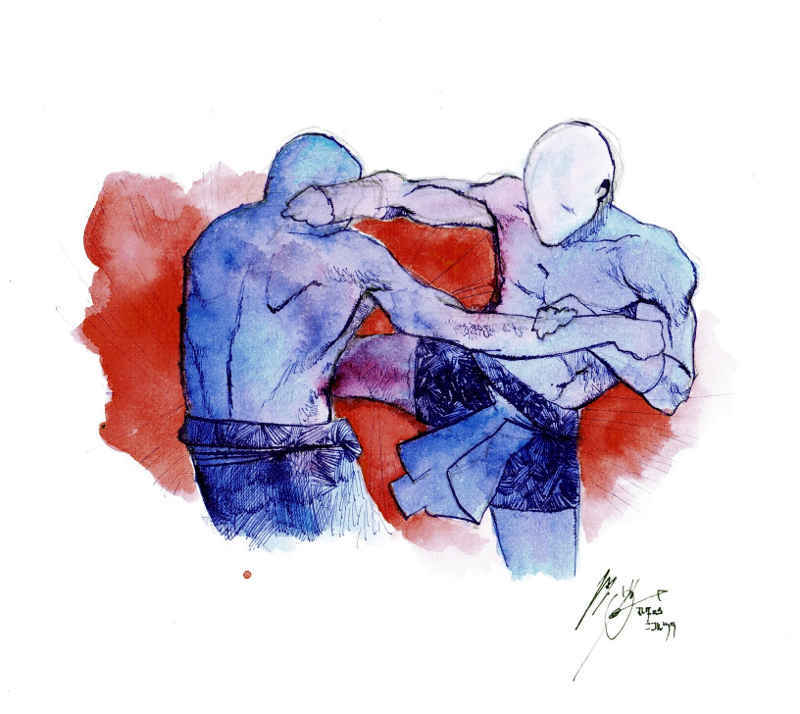 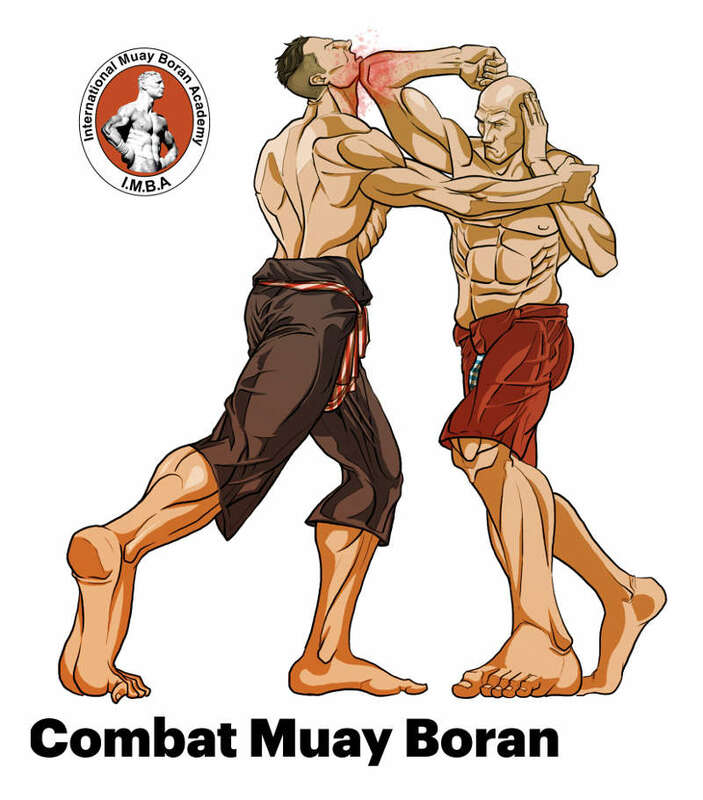 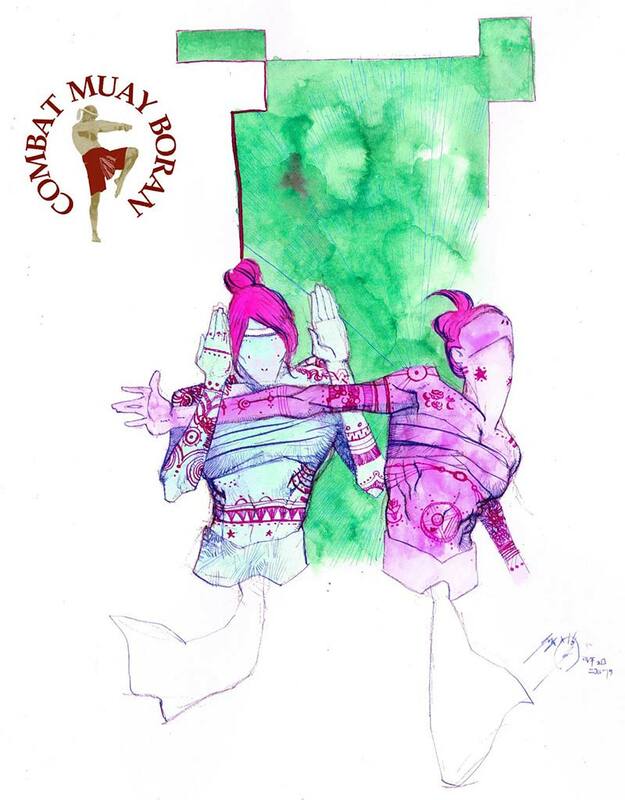 From a technical stand point Muay Boran is based on the scientific use of the nine body weapons or Nawarthawoot (2 fists, 2 legs, 2 knees, 2 elbows and the head) to attack and defend. 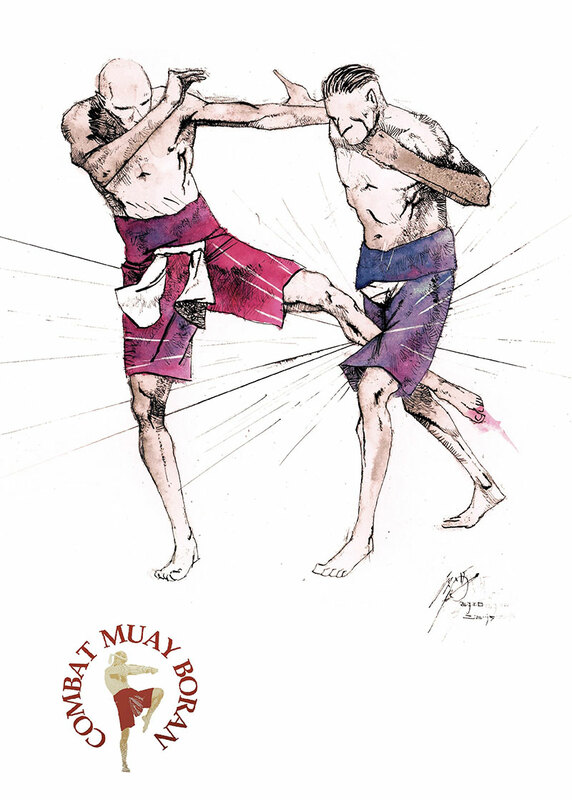 Attacks are executed by striking all parts of the opponent’s body, moreover additional techniques include grappling maneuvers (Kod Rad Fad Wiang), throwing and pinning (Tum Tap), gripping and twisting the opponent’s limbs to break or damage his joints (Chap Hak).